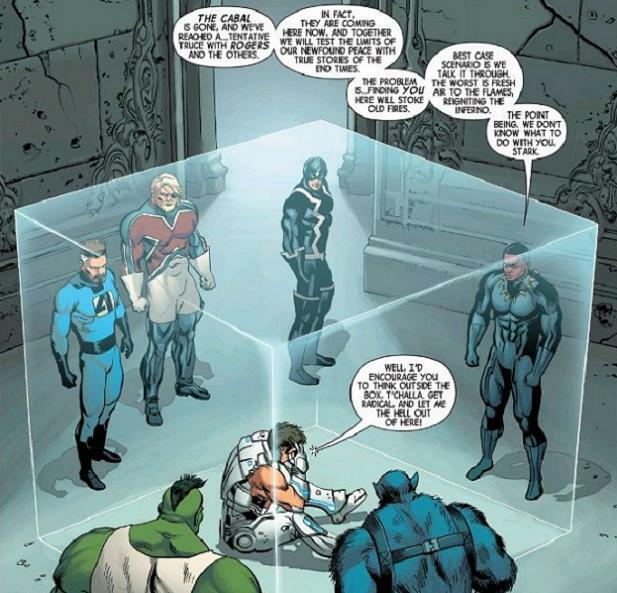 On the heels of all the reductive funneling found in the last few installments of writer Jonathan Hickman’s Avengers epic, this week’s issue takes a slightly different tactic. Front-loaded with several flashback segments, “…And All That’s Left is Ashes” is surprisingly additive as it plows ahead. It’s a lot like throwing on a bunch of last minute topping ingredients right before the whole thing goes into the oven that is Secret Wars. It’s not so much Hickman going out of his way to invent an array of eleventh hour doo-dads and plot devices for the sake of re-cluttering his landscape as it is a calculated combing of the trophy case. In twenty pages, he unveils one “greatest hits” superweapon after another – including all-but-forgotten Tony Stark (Remember him, Iron… something?). 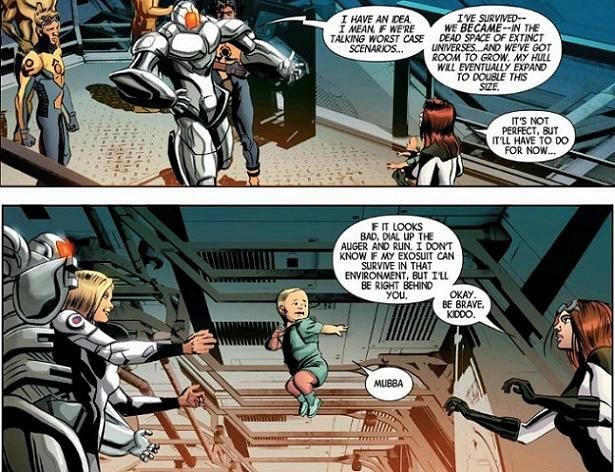 In terms of effect, it’s a direct callback to the writer’s earlier Fantastic Four/FF story circa the 50th Anniversary and the return of Johnny Storm. Then, aliens wanted to bomb the hell outta Earth from orbit as well, with the heroes fighting back on a macro, global level. Mechanically, this issue plays out very much in that pre-ascribed pattern. So, cool reminiscence for the longer-term reader yet maybe points away because, as awesome as the Savage Land geothermal laser is in its Death Star-ness, it does feel a bit like maybe we’ve seen this one before. 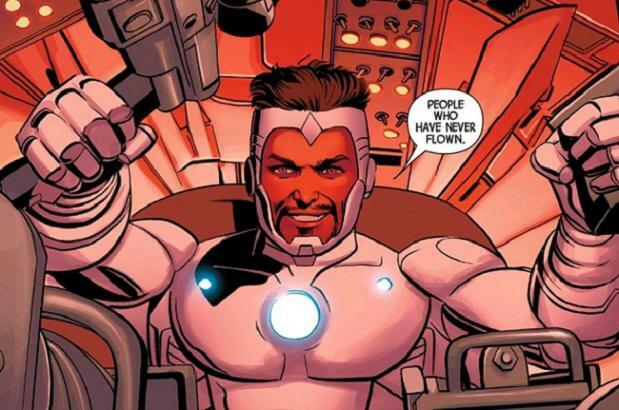 Although only appearing in the opening and closing segments, Tony Stark does quite a bit to shape the overall issue. Once designated as “Master of Machines” on New Avengers’ cast page, perhaps a more appropriate title at the end times might be “Irony Man”. In these scant scenes, Hickman really lays the character bare — resigning Tony to his own cog-like status in the necessity of Earth’s survival yet propelling with signature winking panache and arrogance. For a character seemingly irretrievable for his “Superior” attitude since Avengers & X-Men: Axis, there is definitely a glimmer for future redemption. Either way, let’s just be glad it hasn’t thus far resulted in Stark being replaced by an alternate universe teenage version of himself (Do. Not. Ask.). 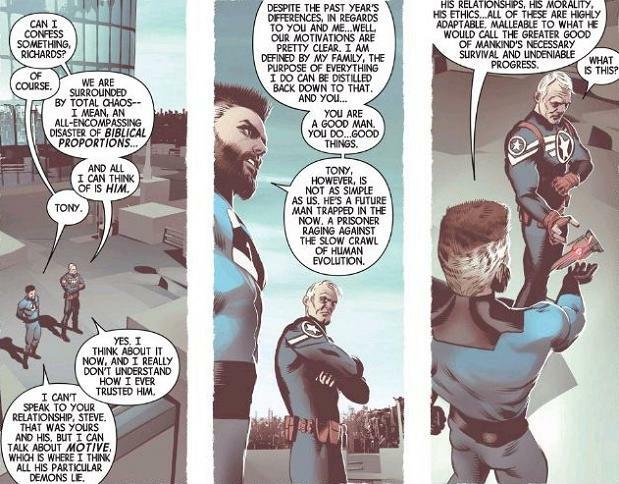 Regarding the wider application of Stark’s gravitas, one of the issue’s nicer touches is a conversation between Mister Fantastic and Steve Rogers. The Reed/Cap dynamic has always been about mutual respect and a fairly level playing field. Their working relationship in the original 1980s Marvel Super Heroes Secret Wars comes to mind, although the less said about the time Reed and Sue joined the shudder-inducing roster of Avengers #300, the better. If this is truly the end of the Marvel Universe as we know it, this is a welcome return to type. However, neither can truly say that they’ve ever had that sort of relationship with Stark. Through admissions in their exchange, they agree that Tony falls into a whole other category — not all dissimilar from being able to pick your friends yet, confoundingly, not your family. Wonder if this is what Thor wrestles with internally regarding Loki? Gladiator’s media buy will not be denied! Another couple of solid character moments also come out of the revolving subplots of Smasher (such as they are). Appearing for a while via hologram, Gladiator’s unease is apparent and multi-leveled. On one hand, he plays his station perfectly- the imposing alien emperor with a regrettable duty to fulfill while his private communique with Smasher reveals a sympathetic comrade-in-arms and kindred spirit. The enigmatic Pod also does more to ensure her (their?) future in three panels than has been done with the character in months. Considering that Hickman effectively halved the ranks of his self-created Avengers last outing, it stands to reason he’s tightening up the focus on those remaining. So, Validator — all eyes on you next, eh? That’s it?! Man, how has nobody broken out of these things?? For all its merit, this issue has its share of outright clunk as well. A great deal is visually-based but there’s also a logical disconnect or some liberal suspension of disbelief in the properties of the Illuminati/Cabal’s clear-cubed prison cells. It’s times like this that one wishes there was some sort of clearly-delineated rock-paper-scissors hierarchy in the back of a Marvel Handbook. 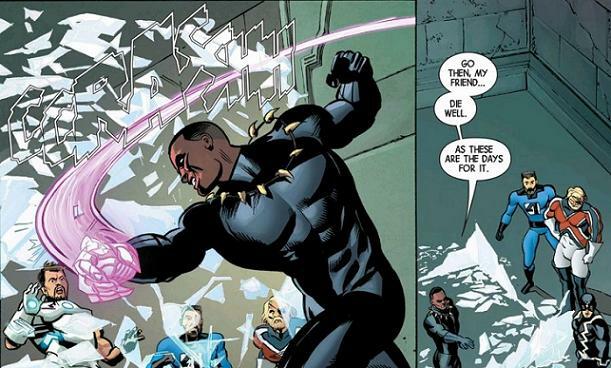 That way “Vibranium claw swipe beats super-whateverthehell-plexiglas which beats half an Iron Man suit” is a known fact and unquestioned throughout the land. 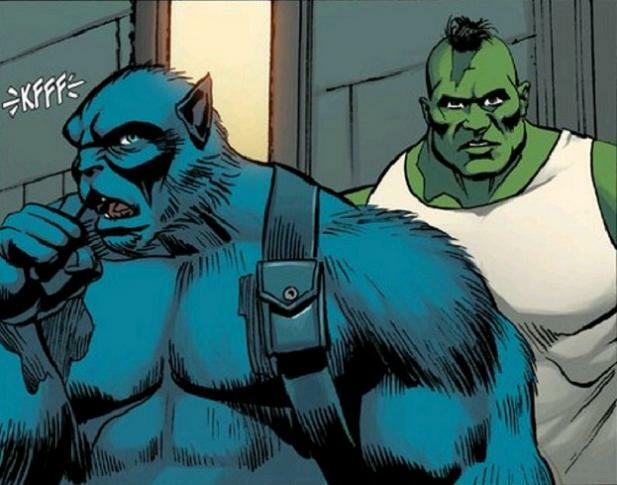 Aside from the total omission of a small yet no-less-important article in a word balloon, the other detractions fall squarely into the realm of artist Mike Mayhew. Fresh off another Marvel one-off assignment involving a different high-volume cast (the Guardians Team-Up chapter of “The Black Vortex” event), Mayhew shows commendable eagerness taking on everything thrown at him. However, the artist may have bitten off more than his share in this instance. With character depictions inconsistent throughout and great variance in linework, one can’t help but wonder if bringing in a separate inker wouldn’t have been an easy fix. Getting a fresh pair of eyes on blending art to color and introducing a whole other dynamic to the mix could only help. Along these lines, as it’s nearing the end, it would’ve been a class move to tap somebody on the shoulder with an Avengers credit or two under their belt in this capacity (Tom Palmer, Wade von Grawbadger, or even Al frikkin’ Milgrom!). There’s a few times they really get it together, though. The aforementioned holograms of Gladiator are a true stand-out element, as is the photo-modified panel of a partially-collapsed Golden Gate Bridge. The other instances are more led by resident color artist Frank Martin. 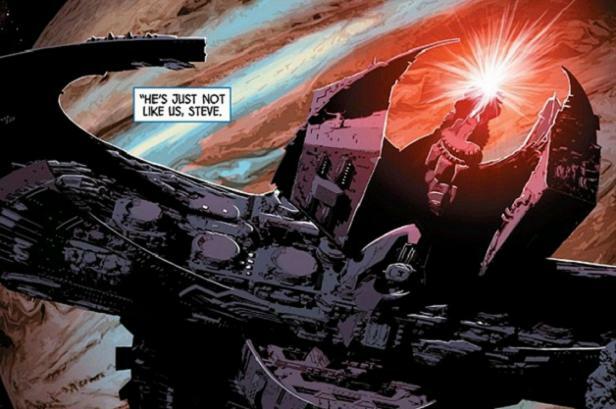 The page of the Builder Planet Killer leaving the Great Red Spot has a richness on par with regular collaborator Mike Deodato. Martin also employs a pleasantly nostalgic light sepia to his washed-out palette in the Cap/Reed flashback. It’s a major selling point. Without robbing momentum from the two-part finale’s impending epicness, this issue only has to tell about half issue’s worth of “forward story”. The flashbacks are padding but illuminating, if not humorously awkward. Mission accomplished for functionality with a small side of grounding humanity. Bring on the end! Did… did Smasher throw her baby?